This week is the Microsoft Ignite conference for IT professionals in Atlanta, Ga., and one legal-specific app will be honored there from out of the over 1,700 apps and add-ins available through the Office Store. The legal calendaring and docketing application LawToolBox365 has won a Microsoft 2016 Office App Award, which it will receive at the app awards session on Sept. 29. At that point, the company will also learn the category it won for. In addition, LawToolBox365 has been selected as one of nine nominees for the Microsoft People’s Choice Award. Voting is taking place this week and the winnter will also be announced Sept. 29. You can cast your vote by going to www.aka.ms/voteappawards. 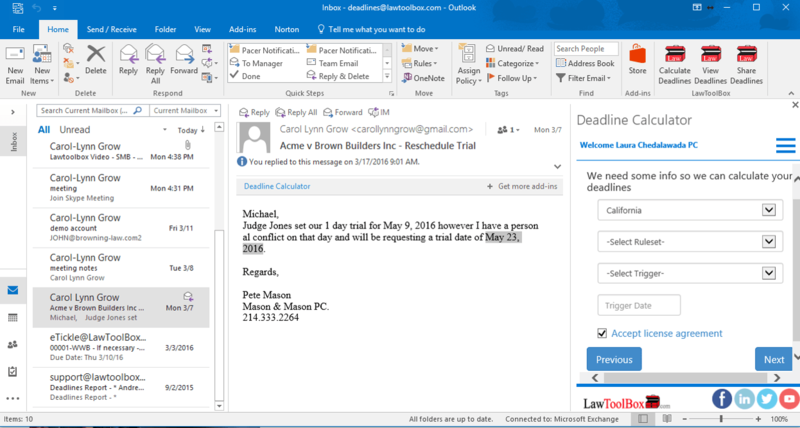 LawToolBox365 is an Outlook add-in that is integrated with Office 365, enabling legal professionals to manage court deadlines entirely from within Outlook. I wrote about it in more detail last June.